Photo courtesy of Josue Rivas. Josué Rivas began his talk at Stanford will these words from John Trudell, renowned Indigenous poet and activist. It’s an affirming statement for a photographer — one who seeks to document the truth for people to see in a way that often elicits strong emotional responses. Josué Rivas (Mexica/Otomi) is an award-winning documentary photographer, videographer and film director. After his experiences at Standing Rock, Rivas founded the Standing Strong Project — a long-term multimedia project throughout which he intends to explore the complexity of indigenous sovereignty and indigenous identity across the continent. He calls Standing Rock “The Awakening,” and it is the first chapter of the project. As he moves the project forward, Rivas hopes to create spaces and provide tools for more indigenous folks to tell their own stories. We are now about a year out from the dramatic police clashes, which led to the eviction of water protectors at Standing Rock. Oil is now flowing through the Dakota Access Pipeline, despite fierce resistance from the Standing Rock Sioux tribe, environmentalists and other allies, who fought (and continue fighting) to defend their drinking water and sacred lands. The legal battle over the pipeline is still ongoing, but for Josué Rivas, the events of Standing Rock have come to mean much more than opposition to the Dakota Access Pipeline. Rivas also acknowledges that “it’s an intimate thing, when you have a camera.” A photograph belongs both to the subject and the photographer, but the subject is usually in a more vulnerable position — especially in a place like Standing Rock, where people were making sacrifices, and grappling with all sorts of issues and traumas. These wounds are communicated both with tenderness and frankness in Rivas’s work. Part of his current expression involves working as creative director for Nahko Bear (of Nahko and Medicine for the People) — an American folk musician and activist. Rivas put together a music video for Nahko’s song “Love Letters to God,” featuring some heavy footage from Standing Rock. He showed this video to the group during his talk, acknowledging that it was still difficult for him to watch. During clashes with the police, many of the water protectors at Standing Rock were maced, hit with rubber bullets or sprayed with cold water so forcefully that it tore skin off their hands and arms. Rivas’s photography, on the other hand, is extremely human. Although not all of his images have people as the subject, they are all closely related to the human experience, and particularly the experience of native people. 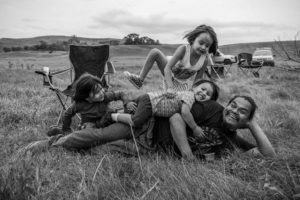 Rivas showed one photograph of a Lakota man, lying in the grass, a smile on his face as his three children clamber on top of him — Rivas took this photo at a healing gathering several months after the camps were cleared out by police. No one is wearing feathers or other ceremonial garb. There are no horses or tipis in the photo. Defying stereotypes of indigenous people, and the conventional mold for portrayal of indigenous people in the media, the photo shows a simple human moment between a father and his children. At the end of the day, Rivas said, he doesn’t separate people based on where they come from, where they stand, or what they identify with. He uses the word “indigenous” to refer to everybody, because “everybody has a story. Everybody has indigenous ways.” The power resides in telling your own story, whatever that may be. Follow Josué Rivas and the Standing Strong Project here. Contact Claire Thompson at clairet ‘at’ stanford.edu. Claire Thompson is a coterm M.A. student in Environmental Communication. In her undergrad, she studied Earth Systems and Creative Writing. She loves food, mopeds, and mountains especially. Reach out to Claire via email at clairet 'at' stanford.edu.